Cover letter example for a transport coordinator job. You can amend this letter as suitable and apply for latest job vacancies. Transport Coordinator job application letter example for you. This letter is fully editable and free of charge. I was extremely interested to read of your advertised for a transport coordinator, and would like to be considered for this position. I have always worked for transport services since the beginning of my career. I would make an excellent coordinator as I am highly organized and take a practical approach with everything. I always provide an excellent customer service. I am specifically interested in working for your company as a result of your excellent standards that you maintain and high reputation. I am ambitious and so therefore would like to be part of an organization that has high standards. I am highly motivated to be successful and your company provides that opportunity. I am a very good team player, and enjoy working with others. I am also interested in your company as you have strong opportunities for promotion. I attach my CV which details my previous experiences as a transport coordinator, and also my education. I have included details of references whom you may contact if you so wish. I hope that you will consider my application to you favorably. I look forward to hearing from you. Please note that I am available at any time for an interview, and I am immediately available to start work . 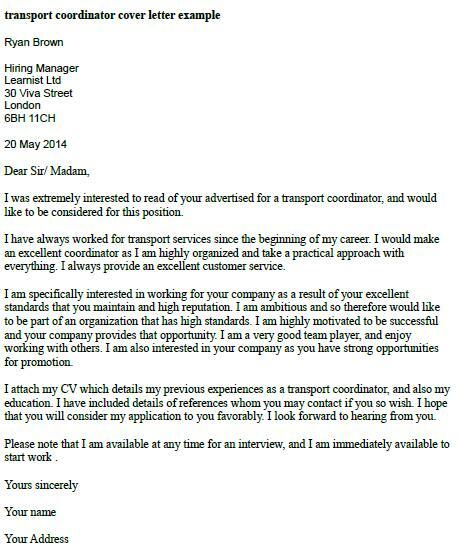 Download Transport Coordinator Cover Letter Example in PDF.